Elise is 20 months old now, which means that we are starting to think about changing her nursery into a toddler room. At the moment she is still in her space saver cot, as she is in the smallest room of the house. We are hoping to change this to a toddler bed by her second birthday in November, and we are also going to change some of the furniture around. 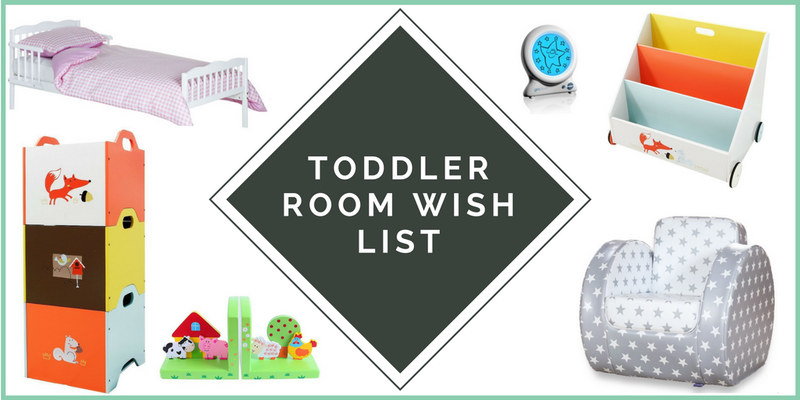 Today I'm going to share a little Toddler Room Wishlist with you all. Elise will be staying in her little room for a little while longer, so we won't be redecorating the room. It is a light green colour at the moment, so we have to make sure that anything new we add to the room goes with this colour scheme. We've also sorted out all the artwork for her room, and we are happy with this. We're mostly going to be changing the furniture so that we can fit a toddler bed in, which is slightly bigger than the cot she has in there at the moment. Most of the furniture in Elise's room is currently from Ikea, so we are hoping to branch out a little bit and add some new brands into the mix. This bed comes with a foam mattress, as well as a bedding set. I am a bit in love with the different bedding options, but I think Elise's favourite would be the Dino set. She is a little bit obsessed with anything remotely related to dinosaurs! We love reading books with Elise, and although we have some magazine racks on the wall to keep her books tidy, we would also like to display some of her favourite ones. At the moment she is borrowing my owl bookends, but I think she would love these farm animal book ends. Although she does have book storage in her room, I thought this would be great for downstairs. She has so many books, and we go to the library every week, so it is always great to have somewhere to keep them. At the moment her books are just stored in a box downstairs, so this is a nice way to keep them tidy, whilst also looking really nice. Everyone loves sleep, but as a parent I know how this can be limited sometimes. We're lucky because Elise is a good sleeper. She tends to sleep from 6.30pm until about 6.30am, but she then wants to get straight up and play. I think this clock will help her to learn to stay in her room until around 7am. This will give her a chance to wake up slowly, instead of just shouting for us straight away! Plus, we may get a bit of a lie in at the weekend! At the moment we use one of the Ikea cube shelves for storage of toys, and some of Elise's clothes. However, we're looking to add a bit more room to Elise's rooms for toys. This means they won't all have to live downstairs. These stackable toy boxes may be a solution for us, as they will take up less room, and we can stack them up to store them away. We've been on the look out for a chair to put either in Elise's room or downstairs. We love the idea of a little reading nook, but I think her room might be a little bit small for this. We'll probably add it to the office, so she can read whilst I work, or downstairs. That is everything on my wish list for now. As I said, her room is quite small and is pretty full at the moment, so we won't be able to add many elements. I will be making a nursery tour video soon, before we change it to a toddler room, so make sure you are subscribed to my youtube channel so you don't miss this! 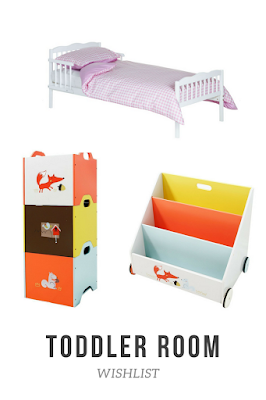 We get most of our furniture from Ikea, but if you are on the hunt for some beautiful nursery or toddler room furniture, make sure you check out PreciousLittleOne as they always have some great offers. THIS IS A SPONSORED POST IN COLLABORATION WITH PRECIOUSLITTLEONE. SOME POSTS MAY CONTAIN AFFILIATE LINKS, WHERE I RECEIVE A SMALL AMOUNT OF COMMISSION IF SOMETHING IS PURCHASED THROUGH THE LINK. THIS DOESN'T AFFECT THE END PRICE OF THE PRODUCT. BY PURCHASING THROUGH MY LINKS, YOU WILL BE HELPING ME TO KEEP THIS BLOG RUNNING SO THAT I CAN BRING YOU AWESOME CONTENT. FOR MORE INFORMATION, PLEASE READ MY DISCLOSURE POLICY.